As you might know, ISPConfig is one of the best free open source hosting control panels available to manage Linux hosting servers in single and multi-server environments. 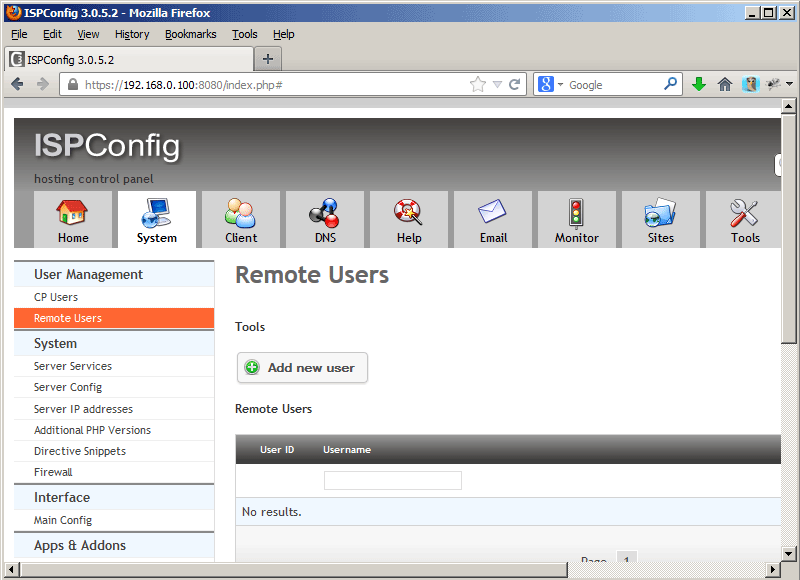 Today you will see how to deploy and install this amazing control panel with ispconfig_setup script. This script is available for free on GitHub at https://github.com/servisys/ispconfig_setup, developed and maintained free from Servisys with the help of the community. The script for now works only on Debian 7 and Debian 8, and some software (like RoundCube) will not be installed on Debian 8 due to stop of support of Debian Community. The installation works only on a fresh install server, so if you already had installed something (Apache, MySql or something else needed by ISPConfig) the install script may not work, or cause strange things. Now you had a folder called ispconfig_setup-master in your /tmp directory. Now it's time to install our ISPConfig control panel with the autoinstall script. The script has two install modes: the standard mode and the expert mode. The two modes are similar, the main difference is that in standard mode the ISPConfig installation is completely unattended, with the expert mode you can configure your ISPConfig for special environments like multiserver setup, mirror or to select only some services to be configured. Let's start with common commands for both modes, then we follow the install process from both modes. all software needed to run ISPConfig 3. At this point, the installation process checks your distribution to detect if the installed OS is compatible with the script, in my case it will detect Debian 8 Jessie. If it's correct for you press 'y', and now you'll be asked some question before the automated install process will start. If you don't know the answer to a question then choose the default by just hitting enter. So we choose standard mode installation, the fastest and most easy way to install ISPConfig in a single server setup with all feature enabled. In case that you don't know what to respond to a question, simply hit enter, the defaults are good in most cases. Now you can go to take a coffee and relax, waiting for the install process to finish. Due to a bug in dbconfig-common we can't automate PHPMyAdmin installation for now, so hit 'enter' and on the next question select 'NO' (attention because the default is 'YES'). In my case, I've used "roundcube" as username and "password" for the password (please don't use this password in a production environment for obviously security reasons). The only difference with the standard mode is the ISPconfig installation script, that is not automated yet and has to be run manually. As mentioned before this is necessary for multiserver setups, single server setups that run just some services and cluster setups. As the script is in costant development any help or suggestion will be appreciated, you can follow us on GitHub at the url https://github.com/servisys/ispconfig_setup, or contact us on ISPconfig forum. a version that will run on Centos would be fantastic! This is a recommended auto installation script released by Diablo666. Really stable and easy to use. I've been using it for my production server. I've tried, and tried, and tried several times and I can't get the duo "ISPConfig3 - Apache2" to work properly. Any new domain I add it creates mydomain.vhost.err in sites available. Then I have to delete mydomain.vhost with text about the error inside, change name of the .err file to mydomain.vhost and restart apache. Only after that the website starts to work. A .err file gets created when apache cant load a vhost file. 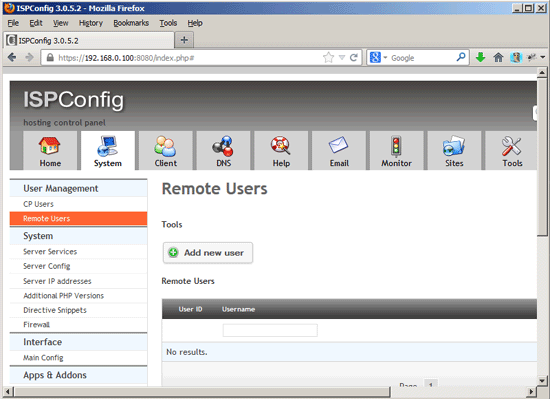 Which text did you delete in the mydomain.vhost file befor it starts working? The lines that you delete indicate which required apache module is missing or inactive on your setup. I didn't delete any text. What I meant was that after adding a website two files are being created: mydomain.vhost (with "# Apache did not start after modifying this vhost file..." text) and mydomain.vhost.err. I haven't modyfied mydomain.vhost.err. I only changed it's name to mydomain.vhost and restarted apache, and it worked as it should. That is why I don't know where is the error. I have just finished installing The Perfect Server Manually from https://www.howtoforge.com/perfect-server-debian-wheezy-apache2-bind-dovecot-ispconfig-3-p3. I have been using Debian 7 minimal system on my VPS in this case and in case of an attempt to use autoinstaller script. Manual Installation succeeded. After another attemt to use autoinstaller script the final was the same as above (.err vhost file, that after renaming to .vhost made website working). Unfortunately, he does not accept my password and Username: admin Password: admin does not take it either! What can I do? How can I fix under Debian 8 the dbconfig-common problem ? Is coming in the near future a newer script out where this problem is sorted? You need to run systemd else you get errors restarting services by ISPConfig. Erreur : le certificat de « github.com » n'est pas de confiance. Erreur : le certificat de « github.com » n'est pas d'un émetteur connu. Works fine here, just used it today to download and run the script. See output below. WARNING: The certificate of `github.com' is not trusted. WARNING: The certificate of `github.com' hasn't got a known issuer. Connecting to codeload.github.com (codeload.github.com)|192.30.252.147|:443... connected. WARNING: The certificate of `codeload.github.com' is not trusted. WARNING: The certificate of `codeload.github.com' hasn't got a known issuer. Any idea if that works also on ubuntu 14.04LTS? I've tried to use it straight away but I get an error immediately because the installer looks in the /ubuntu14.04 folder which doesn't exist. However I renamed the debian8 folder with ubuntu14.04 and it is now installling...not sure thought if everything will be installed properly. Do you know if I should use a different script? thanks that was a big help to change the debian8 folder name. i have run script twices works great thanks! Read the README file before start using. The install script gets stck on "Installing Bind9..." to me. Has anything changed or something because it looks there is no such experience so far?.. I am using standard clean Debian8 VPS configuration (OVH). Please, advise. is it now working for Debian 8? There is no roundcube debian package for Debian 8 anymore and therefor the script can not install it. Hi, this not works on a freshly installed Debian 8 64bit server from Leaseweb Choosed nginx and mariaDB. "Username: admin, Password: admin". You should put this in the tutorial, shouldn't have to read all the comments to find. Very good initiative this installer ! I used it on Debian 8.2, it works perfectly ! My install has remained on "Installing bae\sic packages..." for +12 hours. I began with a minimal install of Debian Wheezy. Seemed to be going ok until it reached "Installing Basic Packages..."
It hung there for 20 hours! Is there something I failed to install first? The automated install script is not made for Ubuntu 14.04 and the commands on Ubuntu 14.04 are not the same then the ones for debian 8. The script will not show errors even if it fails to install packages, so its nit unusual that you did not see any errors. Please use the installation instructions for Ubuntu 14.04 to install ISPConfig on your server (or use the above script but change the server os to debian 8 first). Is there something I need to install first? > Is there something I need to install first? No. The installation may take some time as it downloads and installs a lot of packages. If you would have used the manual installation procedure (perfect server guide), then you would know in details hat happens in each step. I've followed the instructions (setting NO at DKIM as suggested) and everything went fine, but I don't get any e-amail. I've created a forwarder e-mail and I don't get them.I've also tried to create a mail hosted in the webserver but since squirrelmail and roundcube has not been installed (since I selected not at DKIM) then I can't verify. DNS are set fine. 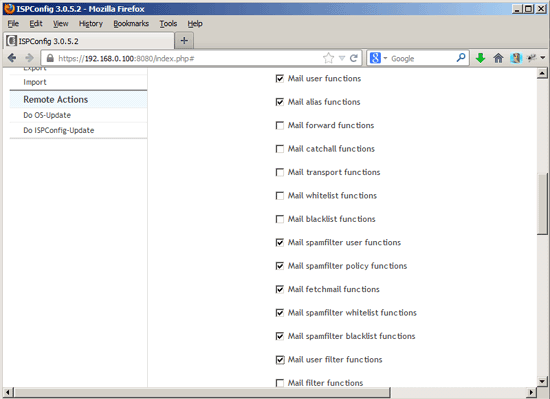 A record point to the IP with the hostname "mail", and the MX record has been set with "mail" and 10 priority. Still, I don't get the email. I'm in a fresh installation of Debian 8 64 bit. Do you have any clue of what can be the issue? Many thanks for the support. It's very appreciated! If you like I, install in a virtual enviroment that only allows coomunication on TCP and UDP, then the installer will fail the connectivity test, since PING isent allowed its not TCP or UDP but ICMP. And the installer will fail. Save and run the installer again. the installer stops at install of Bind9, after waiting half an hour and pressing ENTER it goes on! Hi, tried to run that script twice on Debian Jessie on a working laptop. It stops before end and leaves the system in broken state where initramfs-tools, udev, xserver.xorg, kde-standard and others necessary packages are uninstalled. This script is for servers only. It requires a Debian minimal installation with just running SSH service as basis. If you want to run ISPConfig on your desktop, then better create a virtual machine with VirtualBox or KVM that contains a minimal Debian 8 system and then run the install script in that vm. Hm, for some reason i'm getting the Apache 2 Testpage on port 8080 after installation. I tried installation on a VPS (JiffyBox) several times and also tried several things from manual Tutorial like adding correct hostname to /etc/hosts. Still no luck. vhost seems to be fine. It points to the correct folder. That's ok, it does not mean that apache is used. It's just an HTML page. I got stuck at Bind too, fresh Debian 8 vps. not too sure what is going on here,can anyone explain? I got a fresh droplet on DigitalOcean and ran this auto installer. I added a website in ISPConfig, then added a domain in the email section, then added a mailbox, and lastly added a catchall for the whole domain. MX 1 mydomain.com. MX 5 mydomain.com. MX 10 mydomain.com. MX 1 mail.mydomain.com. MX 5 mail.mydomain.com. MX 10 mail.mydomain.com. syslog: "Invalid settings: postmaster_address setting not given"
But when i read all these comments i dont want to install it anymore. Dont know about the pannel but i think it should do the trick for most of us. Thanks Till and all contributors. i`m missing fail2ban .. is it not included ? Is this script working for ispconfig 3.1 ? Hi Hans, yes it works. Installed ispconfig with automatic installer, everything working properly, but roundcube does not send or receive emails, read in a comment that roundcube not working on debian 8, someone can confirm this, or have any solution to the problem, I made all settings as instructed on the site instação manual. Thanks for any help if possible. Just get access denied on install.sh tried chmod x install.sh and chmod 755 on folders and file not helping any suggestions? 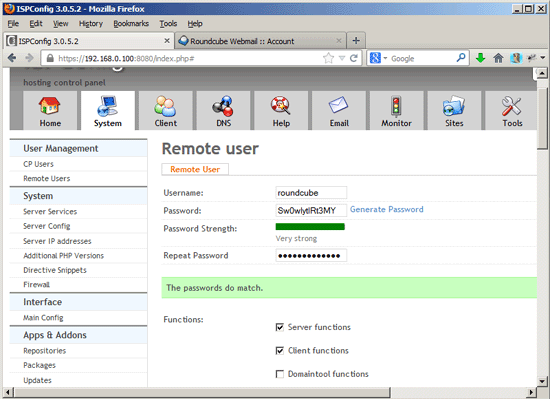 I've been ntryign to get this script to work to provision an nginx based server with roundcube. Every time I try the /webmail alias does not work. What an I missing? Hello for all!I have this same problme "Every time I try the /webmail alias does not work" - roundcube - in auto-install and manual install. I have always used ISPConfig 3 from the beginning. I can not get suPHP to work either. Thanks for ISPConfig Team! Thanks for this best app! SuPHP is outdated and should not be used anymore. Use php-fcgi or php-fpm instead and enable the suexec checkbox. Regrading webmail, edit the apache roundcube.conf file and change the alias /roundcube to /webmail. Thanks a lot for this script, it saved a lot of time.. However, thought that it would follow the perfect server setup instructions step by step. Later figured that it did not install the letsencrypt. I had to manually install it, which is not an issue though, but would appreciate if it was mentioned somehow. I have a serious problem with the script. I started to install it, but it doesn't work. It tells me "Installing basic packages" and nothing... I was waiting at least half an hour, but nothing happened. Can somebody help me? After installation it is not working . Unable to connect Firefox can’t establish a connection to the server at 192.168.0.16:8080. The site could be temporarily unavailable or too busy. Try again in a few moments. If you are unable to load any pages, check your computer’s network connection. If your computer or network is protected by a firewall or proxy, make sure that Firefox is permitted to access the Web. It might bee that you closed port 8080in your firewall, the firewall of your hosting provider or router. ISPConfig 3 on Debian 8 (Jessie) installed by the ISPConfig 3 AutoInstall script as virtual machine image in ovf / ova Format compatible with VMWare and Virtualbox.